If you have a brand new domain for sending cold emails, there are a few things you should do before starting your first campaign with Reply. Once you have purchased a new domain, do not start sending bulk emails right away. You should wait at least a couple of weeks (3 weeks is best) and send emails to addresses within the same domain during this time - reply to these emails or forward them to other addresses within the same domain. This is the very start of a successful and correct email account/domain warm-up. Check the domain records and spam score before you start your outbound campaigns with Reply to avoid having your emails sent straight into a Spam folder. Click on a campaign that you want to change the settings for. On the Settings tab, expand the General settings section. 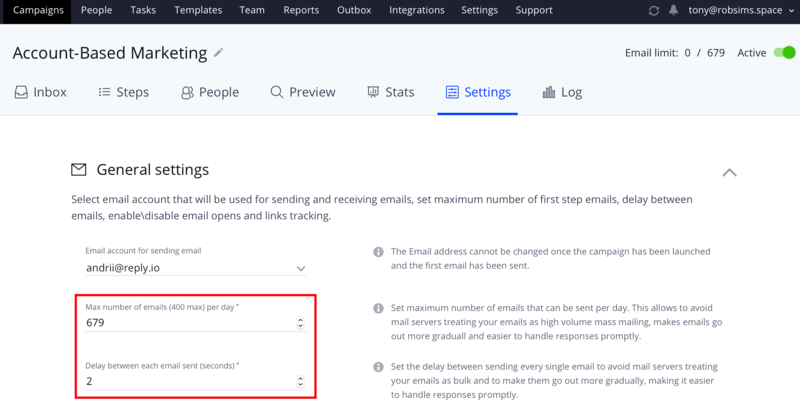 Change the values in the Max number of emails (400 max) per day and Delay between each email sent (seconds) fields.